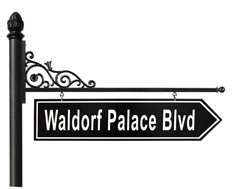 Our street signs are constructed entirely of aluminum and stainless steel (will not rust or rot). 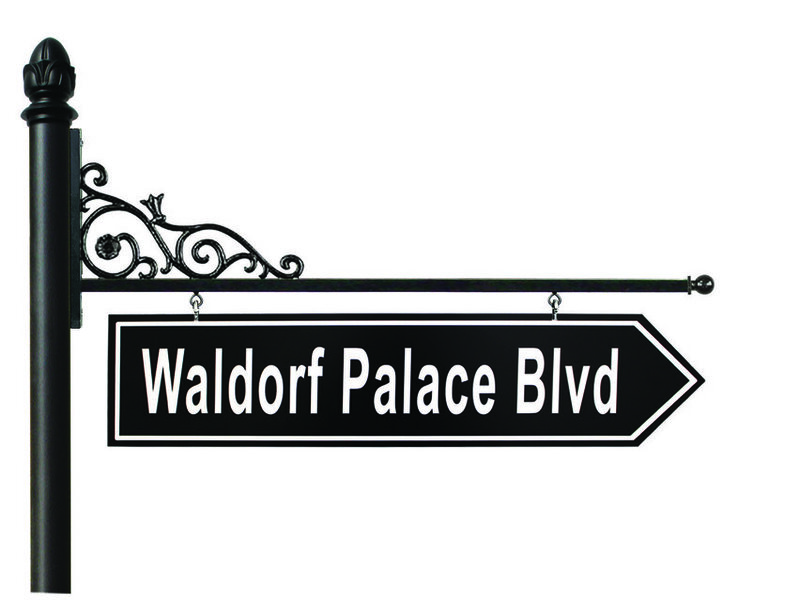 Cast aluminum sign frames for all residential traffic sign shapes can be bolted onto the pole. All signs are built to DOT specs which measure 7' from bottom of first sign to ground unless designated otherwise. Overall height is determined by configuration. Poles come in three lengths: 14' 6", 12', 11'. Pole diameter is 3" OD. Street sign blades and frames are of cast aluminum. Specify either hanging (H) or bolt-on (B). A scroll arm (SA) is needed for hanging blades or hanging blade frames. Raised letter blades are two sided in black, white or dark green. The raised letters and border come in black, gold, or reflective white. Custom colors available. the National Highway System (NHS). RLB-B Cast Aluminum Raised Letter Blade (bolt-on).Use raised letter blades whenever you want the elegant look of old world castings. (bolt-on) with ornate decorative scrolls. Letter Blade (bolt-on) with logo. Logos are designed to meet your communities logo requirements, call or email us with your need (min 10 pcs). Blade (bolt-on) frame with logo on bottom (scroll w/logo can be put on top). Can be used in lieu of back plates to hold any standard sign faces. PPB-13 Double-sided Economy Mounting Brackets. Use double sided economy brackets to save money. Designed to hold (2) signs back to back. Can be used on all standard sign faces in lieu of back plates. Arch Raised Letter Blade - cast aluminum. Call for more info or to place an order. Scroll Arm with Polymetal Sign. Builder Series Poles All poles are 3" Diameter. Please call or email us if you need help ordering your streetsign system. Lead time is approximately 2-3 weeks to ship this item.